I’ve been trying for years to perfect a veggie burger, and haven’t quite succeeded. There’s always something lacking – not enough flavour, or not the right texture. But I think I’ve finally figured it out. I managed to combine all the different ideas I’ve had in the past, and I think I found something that works. One of the most important things I’ve learned is making sure that every component of the burger is seasoned well and tastes good on its own. I opted not to use tofu in this burger, and I must say, it really hit the spot. 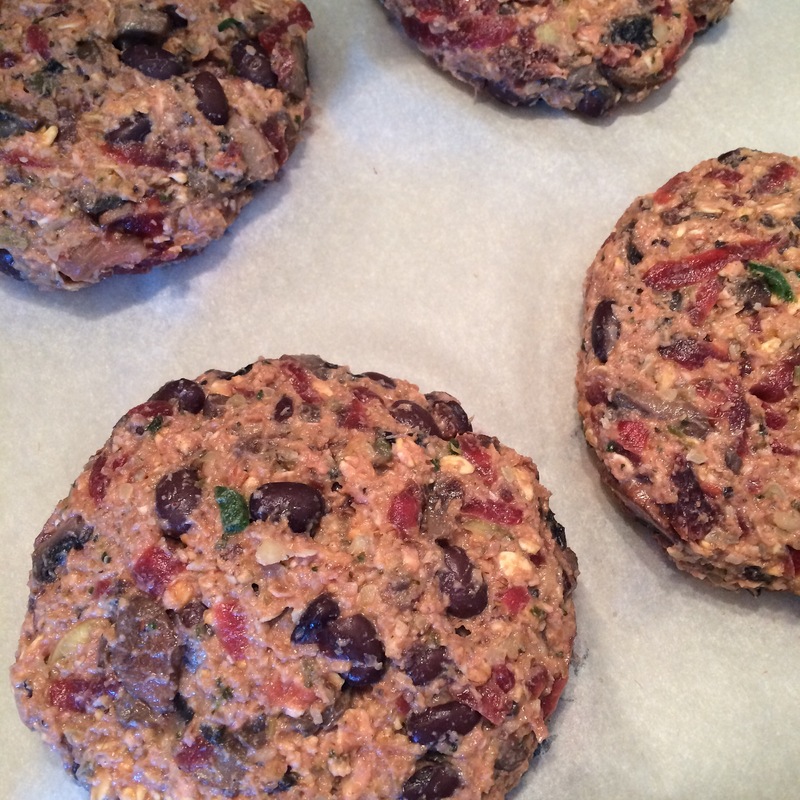 I’m documenting this recipe as I make a second batch of the same burger – the most brilliant part of this recipe is that leftovers are the secret ingredient! In the first batch I made, I used leftover spaghetti (with a green pepper and mushroom tomato sauce); in today’s batch, I’m using leftover brown rice with chick peas and veggies. By running the leftovers through the food processor, it creates a flavourful “dough” – it works well to bind the burger and provides a lot of flavor. As a bonus, it uses up leftovers in the refrigerator (and if you’re like me, you’ll appreciate that – I can’t stand eating leftovers more than once – unless it’s leftover pizza, of course). Also, everyone knows that I’m a bit of a Costco junkie – the bulk of the ingredients for this burger were bought from Costco, which just helps in making a big batch of them and freezing them for lazy dinner nights! Shred the beets on the largest blade in your grater – put into a large bowl. Run the mushrooms in your food processor through a couple of pulses. You want the mushrooms to still be chunky to provide texture. Think 1/4″ dice. Sautee the mushrooms and garlic until all the moisture is released – you should have fairly dry mushrooms by the time they are done cooking. You can add a bit of salt to speed along the process. 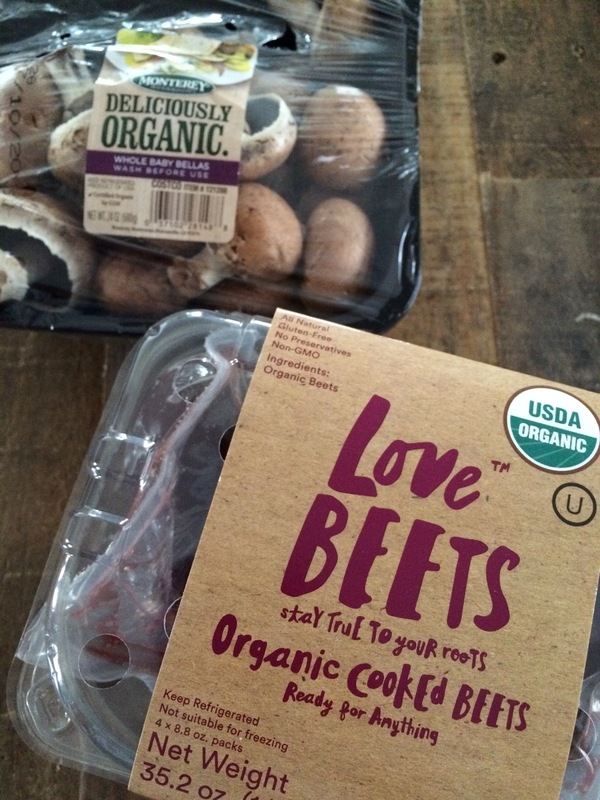 Once the mushrooms have cooled, add to the beets. Add your leftovers, hummus and flax eggs to the food processor and blend until smooth. I would recommend tasting at this point and adding salt and pepper if needed. Add mixture to the beets and mushrooms. Pulse half the oats into finer pieces and add to the burger mixture – add the remaining oats to the mixture without pulsing. Repeat previous step with the pumpkin seeds – half pulsed, and half whole added to the mixture. Add the black beans to the mixture and mix everything together – I recommend using your hands to really make sure everything mixes together. If the mixture is too dry, add a bit more hummus. If it is too wet, add a handful of oats. Form patties from the mixture and place on sheets of parchment paper. If cooking right away, allow them to set in the refrigerator before cooking. Otherwise, stack the patties between parchment paper and freeze.